But now, after one of the most devastating deluges in state history, a billion-dollar industry could be left in tatters. Authorities estimate that nearly 500,000 cattle — worth about $ 213 million (AU$ 300 million) — have been killed by flooding in Queensland’s north since the rain began falling late last month, CNN affiliate Seven News reported. The downpours have ended but the cattle carcasses remain, baking in the record-breaking summer heat. If not buried or burned, they will pose a health hazard. Video taken from overhead at one location shows scores of dead cattle huddled together amid the devastation. “People have gone through drought, they have come out of years and years of drought, and they have now gone smack-bang into a natural disaster the likes of which no one out there has seen before,” Queensland Premier Annastacia Palaszczuk said. But cattle farmers and industry lobbyists say the worst could be yet to come. One of the farmers affected, Rachel Anderson, says she lost an estimated 2,000 cattle in the floods and more are still dying from pneumonia from the cold rain and wind. 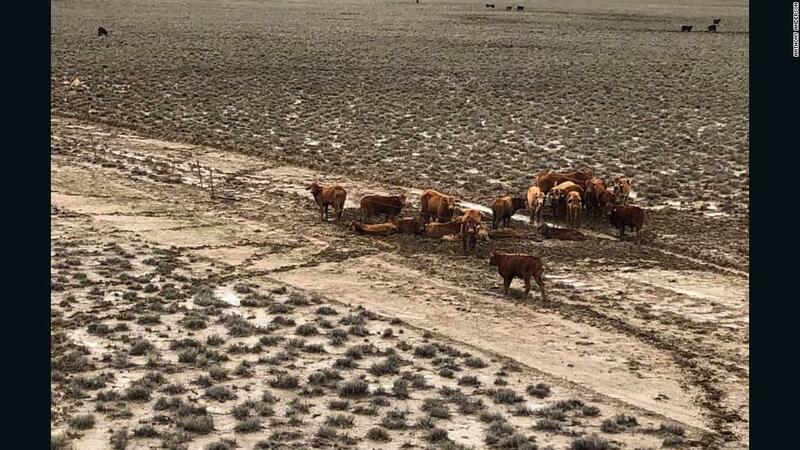 “Some cattle are still quite weak from enduring the many days of rain and not able to access feed,” Anderson, who has five children and owns a farm at Eddington Station near Julia Creek in western Queensland, told CNN. Anderson said her family was already in a lot of debt from hand feeding cattle during the long drought. Now, the devastating floods is putting even more strain on the household. “We can’t borrow any more money as we have nothing as equity as we have lost our cattle and income for the next two to four years,” she said. Australia’s beef industry is one of the country’s biggest economic drivers, with exports in 2017 worth $ 5.3 billion (AU$ 7.4 billion). About $ 6.1 billion (AU$ 8.6 billion) worth of beef was consumed domestically from July 2017 until June 2018, according to trade group Meat & Livestock Australia. But farmers like Anderson are also in a state of emotional and psychological shock after losing the cattle. “The speed and intensity of the unfolding tragedy makes it hard to believe that it’s just a week since farmers’ elation at receiving the first decent rains in five years turned to horror at the devastating and unprecedented flood that quickly followed,” he said. Many of the cattle that survived can’t be reached since roads aren’t passable yet. Authorities have resorted to air drops to provide feed, but the affected areas are so vast they may not be able to reach all the animals in need. Many cattle farmers are bracing for major losses. The Queensland government is providing emergency hardship assistance to those affected. Farmers are eligible for grants up to $ 53,000 but may need more to rebuild herds. Meanwhile, one person has died from a soil-borne bacterial disease after the flood waters receded from the regional center of Townsville, Dr. Julie Mudd from the local health unit told reporters. Another seven have been hospitalized, she said.